TiddlyWiki 2.1.3. Osmosoft.com, 2007. Free. 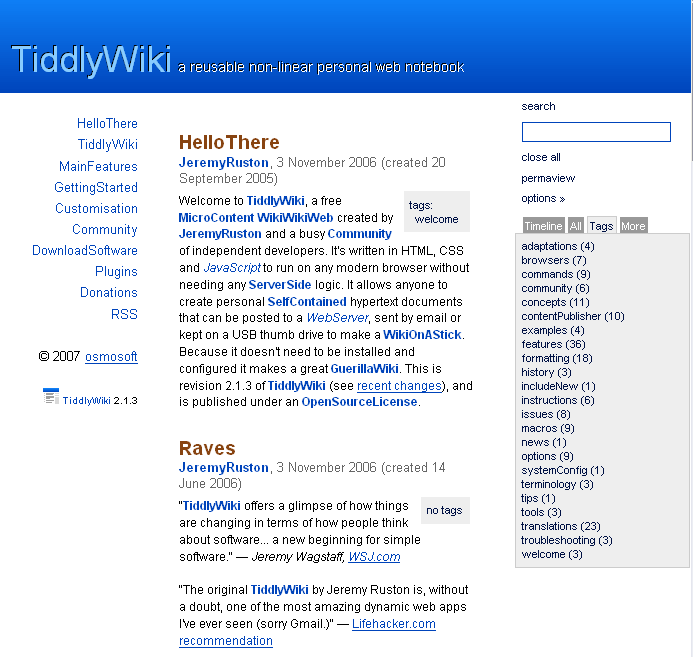 TiddlyWiki is described as 'a reusable, non-linear, personal web notebook' and, indeed, one can use it in that way, restricting access to oneself, but one can also put it on a Web server and make it available to the world at large, or you can build your TiddlyWiki at tiddlyspot and keep it private, or restricted to users with a password, or make it generally available. 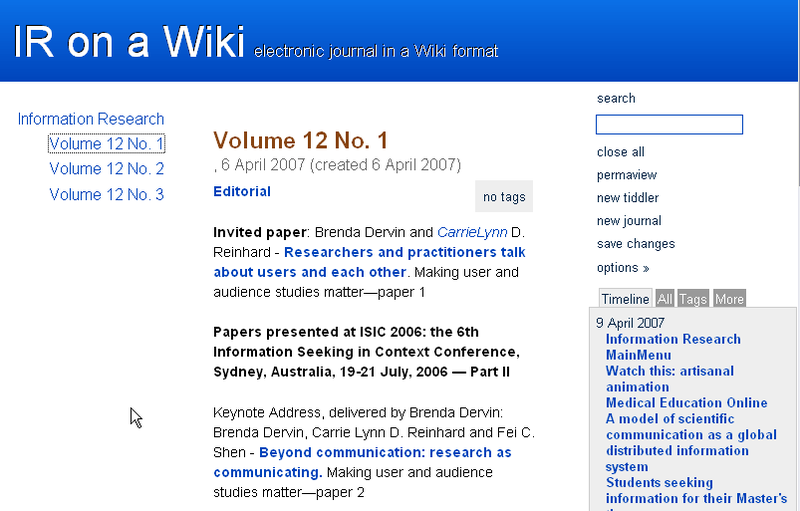 This first screen shot (Figure 1) shows the basic layout of the wiki, which will be recognizable as such to anyone familiar with this kind of tool. 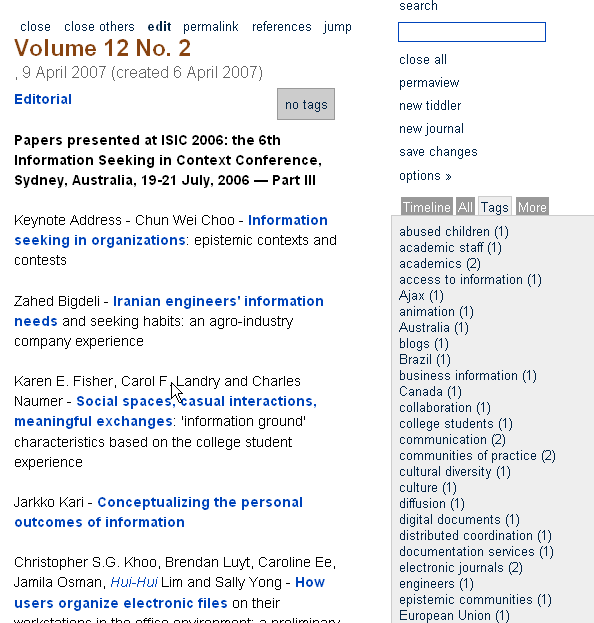 You'll see that there are three main areas to the page: the left side-bar, which carries links to key pages in the wiki; the central area, which contains the information items (called 'tiddlers' here), and the right side-bar, which has certain tools, such as the search function, and a set of tabbed lists, labelled Timeline, All, Tags and More. The Timeline is simply a list of 'tiddlers' produced: click on any one and the 'tiddler' pops up on the page; All, is simply all 'tiddlers' in alphabetical order; Tags are index terms associated with 'tiddlers'; and More, covers anything other than Timeline and Tags. As usual with any Web-based application, movement from area to area is through the links: the difference here is that when you click on anything, what appears is another 'tiddler' on the same page, in other words, another wiki entry. 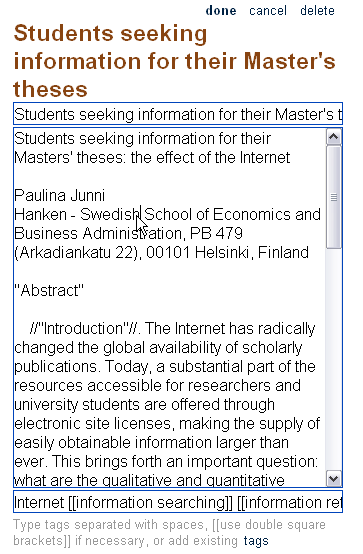 Creating links is simplicity itself: you move into edit mode (by clicking on Edit) and put words and phrases into double square brackets—e.g., [[information seeking]] and create a 'tiddler' with 'information seeking' as its title. TiddlyWiki is being used for all kinds of applications from recipe lists to PhD notes, to presentations, to anything else you can imagine. You'll find some examples at TiddlyWiki for the rest of us, which is a useful guide to supplement the information at the TiddlyWiki site. A TiddlyWiki is a single html file, which is going to get to be a pretty big file after a while: in its present state, Information Research Wiki is 371 Kb, and that is the editorials and abstracts for three issues, so we can figure on about 500 Kb for the abstracts in a single volume of the journal. With twelve volumes by the end of this year, if I had the time to extend the wiki to cover everything from 1995, that would probably produce a file of about 5 Mb, given that the early volumes had few papers. I think that would be manageable for uploading to the server and probably speedy enough for actual use. If I can envisage using it for a project of this size, I imagine that, if you use it to keep notes and reference for preparing a report or paper, it will never get too big.